No wheel can replace the exercise rats receive during free-range time out of their cage. 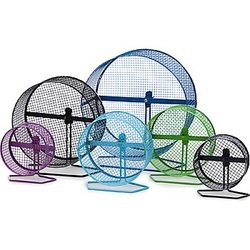 However, when free-range is not an option, or when you want to provide another opportunity for your rats to exercise, why not choose The Wodent Wheel, the only wheel recommended and approved by the ASPCA during their Seal of Approval program (1999-2006)? This wheel is also highly recommended by Rat Clubs. So, what are my thoughts about wheels? I've had a poor experience with wire wheels. Even brand new they seem bent out of shape and out of round. I've never personally experienced a rat or mouse being harmed by one but I don't like the idea that they could. 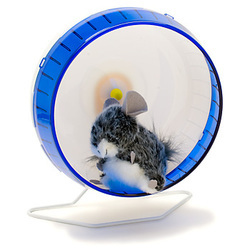 I bought a saucer wheel for my mice originally but their unnatural running movement concerned me a bit. Also, when I put a standard wheel in they completely ignored the saucer and ran on it instead. I'm doubtful there's an appropriate-sized rat saucer and I still don't like the running movement. The Silent Spinner is okay but pricey. I have noticed it's fairly easy for the wheel to separate from the base and I don't care for that. I tried my first Wodent Wheel based on the recommendation from many rat owners. I bought my first one in November 2012 and it is still in use, though the entry holes are a little bit chewed. 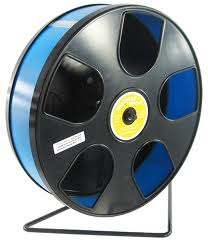 I've personally never had my rats destroy a wheel but I understand it can happen with pets like gerbils. One solution I read was to ensure the rodents have a lot of other things to chew available. The majority of my rats enjoy their wheel though its use does vary based on how much other exercise they get. I agree that they feel more secure due to the semi-enclosed design, and I have never had a rat injure itself on one. The running track is fairly thin plastic so you do hear their feet on it when they run, which I find quite soothing. Occasionally I lubricate the friction points on the axle with baby oil. Vegetable oil also works but I found it leaves a residue. I mount all my wheels to the wire of the cage using zip-ties, mounting them upside-down to allow for flexibility of positioning. The wheel is then easily removed from the base for cleaning, leaving the base still attached to the wire. To remove the wheel you detatch the hitch pin holding the wheel to the axle, then it slides right off. The top separates from the track which separates from the back and everything is washable. If you still aren't sure how I feel about these wheels, I like them so much that I am now a distributor of them. Any profits made go to our rat rescue operations. If you have any unanswered questions, feel free to ask! Front & back colors: Black, pink, blue, white. Track colors: Dark green, lavender, light blue, red. Front & back colors: Black, white.